Do Re Mi and You is an innovative blend of singing, dancing, creative movement, instrument exploration, and personal expression. Our classes are rooted in quality LIVE MUSIC of American folk, world, and popular genres. The instructor accompanies the singing with guitar, banjo, drums, or piano. Creative movement with scarves and many other props, based on the Dalcroze/Eurhythmic method, is also central to this class. Babies and toddlers are natural explorers, so instrument exploration is weaved into structured, and free exploration time. All of this is offered in a beautiful, state of the art classroom in our facility. Every week, my 2 year old grand-daughter and I look forward to “Do-Re-Mi.” We ask if she knows what day it is, and she’ll say, “Do-Re-Mi!” and can’t wait to go! The lead teacher, Emily, combines love of music, training in the Dalcroze method (where children learn how to move to music), and sensitivity to each child’s needs. The parents and grandparents have a chance to interact with the children through music, and enjoy the class as much as the children! Three months ago, when our grand-daughter started the class, she wanted to “just watch.” Now, she’s an enthusiastic participant, and has thrived in the friendly, small group setting. 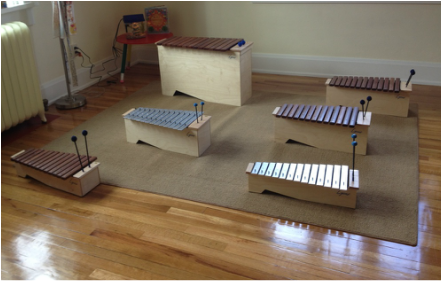 She’s become familiar with the songs and enjoys playing the instruments, which include multicultural percussions and a set of beautiful xylophones. I feel very fortunate to be a part of this outstanding early childhood music experience, with such a gifted teacher! -Kathy S.
Mondays & Wednesdays, 10:15 – 11 a.m.
$120: 10-Class Punchcard ($12/class), expires a year after purchase. Can be used Mondays and/or Wednesdays. Full Semester: Prorated and charged at $10 / class. Please inquire with the SoFA Director. *Sibling Discount: When one sibling pays full price, receive 50% off the second child's tuition from the same household. Discount will be applied automatically at checkout, or you may pay with cash or check at your first class.